People send me all sorts of press releases about different foods and ingredients. But one that recently caught my attention was about Pereg’s new Hawaij spice combos. I was intrigued enough to say “yes” when samples were offered. I love trying out new spice blends and experimenting with them in recipes. In fact there are two such mixtures: savory Hawaij for soups, meats, vegetables and so on, and sweet Hawaij for coffee. The Pereg savory blend includes ground cumin, turmeric, coriander, black pepper, cardamom and cloves, a flavorful combination of warmth and spice, an aroma that’s magical. The coffee-blend contains ginger, cinnamon, cloves and cardamom. The company sent me both, so — I got cooking. 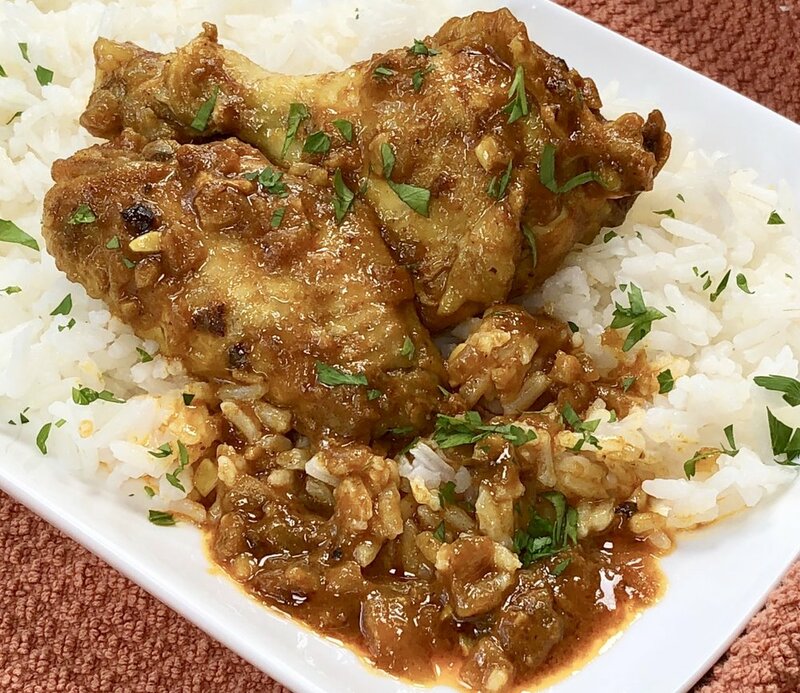 The first recipe was so good I have made it several times already: braised Cornish hens in a coconut milk based curry-type sauce, served with cooked rice and a green vegetable. I have since made this recipe a few more times using chicken wings and bone-in chicken breasts. The coffee spice? I used it to season homemade honey muffins. I added some to my afternoon coffee (a middle-eastern counterpart to American pumpkin-spice latte). And I couldn’t leave it at that so I made some Hawaij-coffee-spice ice cream. I see more to come in the future of this fabulous spice blend. Preheat the oven to 375 degrees. Heat the olive oil in a saute pan over medium heat. Dry the surface of the hens or chicken, place them in the pan and cook them for 4-5 minutes, turning once or twice, to brown the surface. Remove the pieces to a dish and set aside. Add the onion, lemon slices and garlic to the pan. Sprinkle with hawaij and salt and pepper to taste. Stir to coat the ingredients evenly. Return the hens/chicken to the pan, spoon some of the onion mixture on top. Pour in the coconut milk and stir to blend it in. Cover the pan. Place the pan in the oven and cook for 30-35 minutes or until the meat is tender and cooked through. Place the rice on a serving platter. Remove the hen/chicken pieces from the oven and place them on top of the rice. Keep the platter warm in the oven. Place the saute pan over high heat on the cooktop. Bring to a boil, then simmer the pan juices for about 4 minutes or until slightly thickened. Pour over the hen/chicken and serve. In our family we don’t wait for Superbowl Sunday to feast on chicken wings. We eat them throughout the year, often. In fact, I have an enormous file folder filled with recipes, maybe almost as many recipes for wings as for banana bread (and as everyone who reads this blog knows, I have a lot of recipes for banana bread!). Here’s one of the latest versions. Eat anytime. Don’t wait. Preheat an outdoor grill or oven broiler. Wash and dry the wings and cut them into separate pieces. Brush with olive oil and grill, turning once, for 8-10 minutes or until lightly browned. While the wings are cooking, mix the maple syrup, mustard, chives, cider vinegar, soy sauce, garlic, cayenne pepper and salt to taste until well blended. Brush this glaze on the wings and cook for another 10-12 minutes, turning the wings occasionally and brushing with remaining glaze, until crispy and fully cooked. Back in the day, before so many modern kosher cookbooks hit the market (including my own Hip Kosher and The Modern Kosher Kitchen), anyone who was kosher and wanted to expand home cooking beyond the traditional family favorites would buy a cookbook and adapt recipes in accordance with kashrut. Although it’s easier now to find contemporary kosher recipes, there is still a whole world of flavors, wonderful foods and good cookbooks out there that are too good to be missed. There’s still a reason to look beyond the obvious kosher cookbook market. Recently I came across this book: Spice Spice Baby: 100 Recipes with Healing Spices for Your Family Table at my daughter’s house. The author, Kanchan Koya, is a Harvard-trained molecular biologist who blogs about the health benefits of spices at www.spicespicebaby.com and is also a chef-creator for www.Buzzfeedtasty.com. I found the recipes in this book irresistible. Too good to be missed. They are interesting, intriguing and globally inspired. All include one or more of 15 spices that have health benefits (which she discusses in the book). I made several of the dishes, changing what was needed for the kosher kitchen. The original recipe here included boneless chicken — I changed it to wings because my family likes them. The sauce contained yogurt, which I changed to coconut milk plus some lemon juice, to mimic the tart dairy taste. But the spices — unchanged. They are a fabulous tasting, intoxicatingly aromatic blend. This dish was awesome. We gobbled it up, every morsel. The flavors are vibrant, satisfying, and perfect for autumn when the weather turns and there’s a chill in the air. Check out Koya’s website. Lots of good stuff. Btw, I was not paid for this post nor did I receive any book or benefit. I included a photo from the book showing the original recipe (photo credit to www.wayne-wong.com) so you can see how different it looks with the chicken wings. Heat the olive oil in a sauté pan over medium heat. Add the onion and cook, stirring frequently, for about 10 minutes or until the onions are lightly browned. Add the ginger and garlic and cook for another minute. Add the tomato paste, cumin, coriander, turmeric and cayenne pepper and stir the ingredients into a paste. Stir in the coconut milk and lemon juice. Add the chicken, sprinkle with salt and pepper and cook for 2-3 minutes. Stir in the water, cover the pan, lower the heat and cook for 15 minutes. Remove the cover and cook for another 5 minutes, stirring occasionally. Sprinkle with chopped coriander or parsley if desired. You can never have too many recipes for chicken wings, whether or not you watch or even care about the Superbowl. 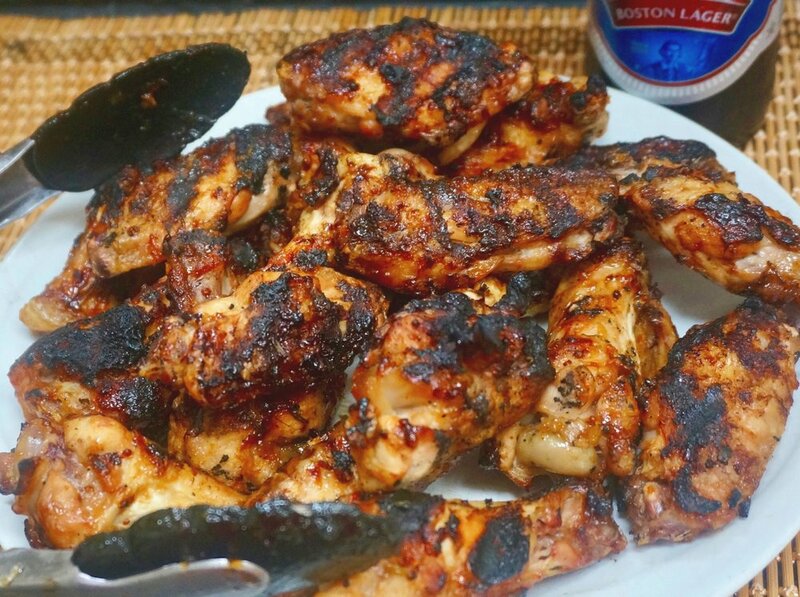 My latest chicken wing recipe came about recently, after I attended a honey tasting with my friend Liz Rueven, who blogs at Kosherlikeme. We went to Red Bee Apiary in Weston, Connecticut, where all of us were in rapt attention as beekeeper Carla Marina Marchese told us all about different kinds of bees and different kinds of honey. Then we had a feast of single origin honeys with tidbits of food (cheese, fruit and so on) that went best with them. Of course, everyone knows that there are many varieties of honey and they all have a unique flavor. No different than wine, for example. You don't have to be an expert to understand and appreciate the differences. But it is fun to taste several all in one sitting. So I recommend this place (or one near you if you don't live in Connecticut). After it was all said and done I bought a few jars of honey and experimented with them. Buckwheat honey proved to be very interesting to work with. It has a distinct, intense, almost molasses-ey flavor that makes it a big winner for cookies, muffins and similar types of baked goods. Or baked apples. Or mashed sweet potatoes and so on. But my favorite was this recipe for chicken wings. Just in time for Superbowl. Or whenever. Preheat the broiler with the rack at least 6-inches from the heat. Place the honey, orange juice, chives, mustard, orange peel and salt and pepper in a bowl and mix for a minute or so or until well blended. Add the chicken wings and toss them in the liquid to coat all the surfaces. (You can let the chicken marinate for an hour or so if you wish.) Place the wings in a single layer on a baking sheet. Broil the wings for about 15-18 minutes, turning them every 3-4 minutes to prevent over-browning. Tu B'Shevat may not be the most well-known Jewish holiday but it always conjures up good thoughts and fond memories for me. First: it was when my parents gave money to plant trees in Israel. Second: it was when my Mom would buy dried figs that came in a wreath of sorts, the figs tied together with string, and I ate at least half of them. Third: it was when my Mom made her famous Date-Nut Bread. And more: spring is coming soon! And finally: it is one delicious holiday, featuring foods that include lots of fruits and vegetables. So, this year, to celebrate I am making this chicken dish, which includes figs and grapes, and served on cooked, fluffy bulgur wheat. Boil the cider for about 5 minutes or until it has reduced to 3/4 cup. Heat the vegetable oil in a sauté pan over medium heat. Add the chicken and cook for 8-10 minutes, or until lightly browned, turning the pieces occasionally. Remove the chicken pieces and set them aside on a plate. Add the shallot, ginger and diced figs to the pan and cook for 1-2 minutes over low-medium heat. Return the chicken to the pan. Sprinkle the ingredients with curry powder, Aleppo pepper and salt and black pepper to taste. Pour in the reduced cider. Turn the pieces of chicken to coat all sides with the pan ingredients. Cover the pan, turn the heat to low and cook for 15 minutes. Add the grapes and cook for an additional 10 minutes or until the chicken is cooked through. Sprinkle with chopped fresh mint. Serve on a bed of cooked bulgur wheat if desired. What I am about to say may acknowledge me as a dinosaur but here it is: I remember the time before there was a Superbowl. I remember the first Superbowl. 1967. I didn't watch. It was sort of a big deal, but not nearly the kind of nationwide (worldwide?) event it is today. I can't recall what people served at Superbowl get-togethers. Or even if there were Superbowl get-togethers. But I do remember that over the course of time, people everywhere used the occasion not only to watch football or bet, or both, but as time for a relaxed day with good friends and casual food. Like chicken wings. I can remember before Buffalo Wings became a thing. And that after they did, wings of all sorts became one of the popular Superbowl foods. For me -- wings were always a thing. The best part of the chicken. My mother told me they were the best part mostly because of the soft soft meat between the two narrow bones in the middle part of the wing. She made chicken wings for us often. I have made chicken wings often too. My mother was right. They are the best part of the chicken! Whether or not you serve them for Superbowl. But if you do, how about these? Cut the chicken wings at the joints, wash and dry the pieces and set them aside. Combine the red wine, soy sauce, brown sugar, crystallized ginger, lemon juice and garlic in a large container. Add the wing pieces and let marinate for at least 2 hours. Preheat the oven to 400 degrees. 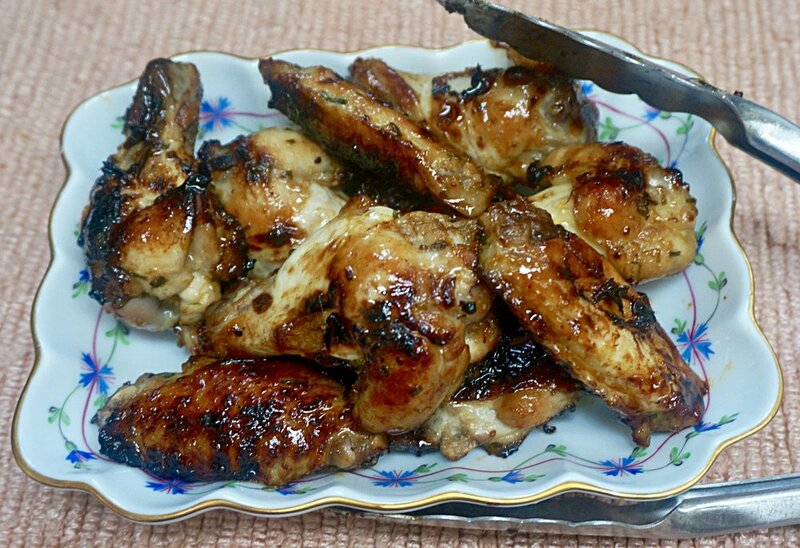 Place the wings in a single layer on a baking sheet. Bake for 15-18 minutes. Turn the wings and bake for another 15-18 minutes or until crispy. I know there are differences in the traditions among observant Jews as to whether certain ingredients are permitted during Passover. Like beans, which most Ashkenazy Jews won't eat, but if your background is Sephardic, well, then beans are ok. It's the same for curry powder, which contains cumin, which can be questionable and is generally not on the kosher for Passover list for many. 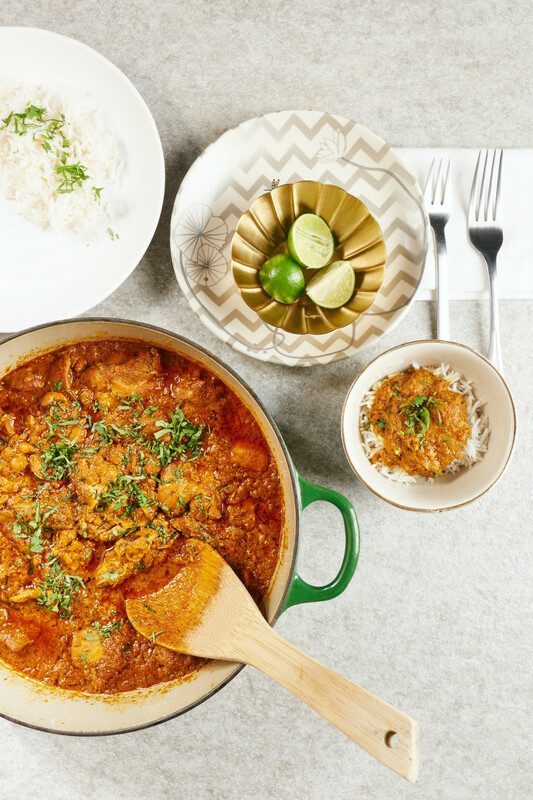 And so, if you're looking to use up your curry powder here's a goodie for dinner this week. The other benefit? This recipe has four ingredients (not counting salt and pepper, which are optional) and is so easy that you will be thoroughly grateful for this dish during the tremendously busy time right before the holiday. And also during the year whenever you're busy and need a quick-and-easy dinner. Also, it's really really tasty. And perfect with rice, which you might be wanting to use up as well. Preheat the oven to 425 degrees. Place the chicken in a roasting pan. In a small bowl, mix the orange marmalade, lemon juice and curry powder together and spoon over the chicken. Season with salt and pepper to taste. Place the chicken in the oven. Roast for 10 minutes. Baste the chicken and turn the heat down to 350 degrees. Roast for another 25-30 minutes, basting occasionally, or until the chicken is cooked through and the skin is crispy. Turn on the TV or radio and all you hear about is South Carolina. Now, I realize that the presidential primaries are coming up (Republicans on February 20, Democrats on February 27). So all this yakyakyak is not surprising. And of course, South Carolina has always made news, politically speaking. For example, do you remember in American History class learning all about South Carolina Senator John C. Calhoun, who was also Secretary of State and Vice-President (under both John Q. Adams AND Jackson), and famous for his fierce advocacy of states' rights, his fierce defense of slavery and his fierce leadership in the secession of southern states from the Union? Remember Strom Thurmond? The South Carolina Senator who ran for president in 1948 (as a "Dixiecrat" aka States Rights Party) and actually got 39 electoral votes? He switched from Democrat to Republican in 1964 because he opposed the Civil Rights Act (in fact, in an attempt to stop the bill from passing he conducted the longest filibuster in history by a single Senator). Chris Rock and Steven Colbert -- also from South Carolina, btw. So all this political talk got me to thinking. I did some looking and read about a famous South Carolina dish that sounded so delicious I just had to try it. It's called Bog. Basically, it's like a pilaf, or paella, with chicken and sausage. It may be called Bog because the chicken gets bogged down by rice. Some recipes are more soup-y, so maybe it's called bog because it looks boggy. In any case, the rice absorbs all that fabulous chicken flavor and becomes a golden/amber color (if you've ever cooked chicken and poured the roasting juices over cooked rice -- that's what this tastes like. OHMY it's good.). I looked at several recipes, then devised my own. Is it authentic? Does it taste like Bog that I might be served in South Carolina? I have no clue, because I never tasted it. All I can say is -- try it, you'll like it. Big winner. Heat the olive oil in a large, deep sauté pan over medium heat. Add the sausage pieces and cook, turning the pieces occasionally, for about 4 minutes or until lightly crispy. Remove the meat from the pan and set aside. Working with a few at a time, add the chicken pieces and cook, turning the pieces occasionally, for 6-8 minutes or until lightly browned. Do not crowd the pan. Remove the chicken pieces from the pan and set them aside. Add the onion, garlic and celery to the pan and cook, stirring occasionally, for 3-4 minutes or until the vegetables are slightly softened. Return the sausage and chicken to the pan. Add the thyme. Pour in the chicken stock. Bring the stock to a simmer. Cover the pan and cook for 15 minutes. Add the rice, stir it into the liquid and sprinkle with salt and pepper to taste. Cover the pan and cook for about 25 minutes or until the rice is tender. Okay, there's actually no dish that's a must for Superbowl Sunday. It's not like Thanksgiving with a turkey or doughnuts during Hanukkah. BUT, a whole lot of people are probably going to be eating chicken wings some time during that day. Me? I never needed an excuse or a holiday or an event to eat chicken wings. They have always been my favorite part of the chicken. So I have lots of recipes. Lots. Preheat the oven to 400 degrees. Place the jam, brown sugar, soy sauce, Dijon mustard, ginger, garlic, scallions, paprika, cayenne pepper and salt and pepper in a bowl and mix to blend ingredients thoroughly. Wipe the chicken wing parts and place them in a single layer on a baking sheet. Brush with half the jam mixture. Bake for 15 minutes. Turn the wings. Brush with the remaining jam mixture. Bake for another 15 minutes or until the wings are lightly crispy. My daughters used to say that we were all going to turn into chickens. Because we always ate so much of it. Fact is, chicken is easy to cook. It doesn't take long. It is the kind of food that you can use just about any seasoning or sauce on and it will taste good. You can fry it, bake it, broil it, grill it, braise it -- on and on -- and it's also good. Even the leftovers are useful and good. With all those benefits, who wouldn't eat a lot of chicken? Anyway, even though I have my favorite chicken recipes, I am always trying to prepare it in different ways, just so dinner won't be boring. This recipe, using ginger preserves, was a quick, easy, fabulous dinner. Preheat the oven to 425°F. Rinse and dry the chicken pieces and place them in a baking pan. Combine the ginger preserves, Balsamic vinegar, mustard and rosemary and spoon over the chicken. Sprinkle with salt and pepper to taste. Bake for 10 minutes. Reduce the heat to 350°F. Continue to bake for about 30 minutes or until cooked through.